I loved where the story of this book started. That first scene was so startling, but so important for understanding just how devastatingly bad Jayson was hurt. Wow. And then the book jumps to 15 months later, where miraculously Jayson is still alive, although living in horrific pain every day. My heart hurt for him. I've dealt with back pain and cannot imagine the levels of pain that he is dealing with on a constant basis. It's pervasive when it's bad and could see how he could get so low and desperate for some relief. Layla has only known Jayson since he was hurt. They met while he was recovering at Walter Reed...and he kind of hates that. She's never seen him when he wasn't crippled by pain, so he's willing to do about anything to change that, even risk his life. As a former special ops military dude, it's really hard to sit back and not act. To make matters worse, Layla just became an operative in DCO and is about to go out on her first mission where things could go bad. 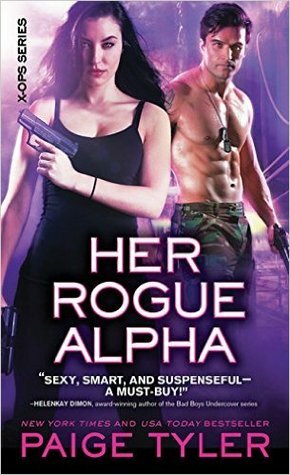 The soldier in Jayson wants to protect her, even though he knows she's highly trained. So while she's gone, he's offered everything he could want...to be whole and to be able to partner with Layla so he could ensure her safety. There's just one catch...it might kill him. Overall this was another good installment in the X-Ops series. I wish more time had been spent on the issues that drove Jayson to take those extreme measures just in that I think it could have heightened the emotional impact. But as the book is written, it is one non-stop action adventure after another. I loved how Jayson threw himself into the mission despite the pain. The teenage story line in the war-torn Ukraine was also really interesting...I liked the two additional teens that really stood out in the story. I'd like to think they went on to find their own HEA with one another. There's a secondary story line about a jewel thief that I found just as intriguing, and am excited that the shifter involved in that story will be in an upcoming book. I liked her and her no-fear attitude.